Guided Aisle Cantilever Racking consists of the same basic components as Conventional and Free-Path systems, but with runs positioned closer together to eliminate the waste of space of a wide aisle. 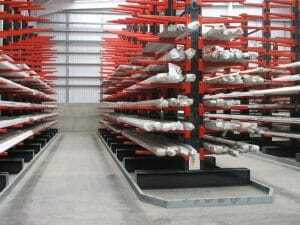 Long load products can be stored to a far greater height to ensure cubic space is utilised to the full. Long load products are accessed using specialist trucks which are guided by guide-rail systems to avoid damage to the rack structure. One market leading metals company with such requirements approached Stakapal to provide their services for the company’s expansion of its West Midlands site. The site’s specific purpose is dedicated to the company’s Long Products markets combining a more personal localised service to its customers that is backed up with mill global purchasing. Stakapal’s advanced engineering capability, superior rack design and competitive pricing structure meant that despite tough competition, the organisations preference to Stakapal prevailed. The project consisted of the supply and installation of the new Cantilever Racking as well as the utilisation of existing Stakapal Cantilever Racks that were already in place. The assembly programme of 3 weeks commenced with the installation of new single sided and double sided constructed racks. Column heights of 6 metres and 12 arm levels and load carrying capacities of 14,300 kgs per column side, meant that a bespoke design specific to meet the clients needs were required. Floor mounted guide rail was provided to assist guidance of the multi-directional trucks down operating aisle widths of 2.4 metres, lead-in sections positioned at the end of aisles and transfer locations aid easy access from one aisle to another. 100 accessibility to individual packs. 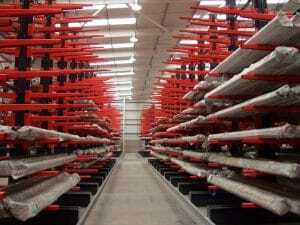 Configuration provides higher density than that of conventional Free-Path systems. Specialist side loading trucks or multi-directional reach trucks are required to operate within reduced aisle widths. Increased cost of specialist trucks can often be offset by the added value or better space utilisation. From Aluminium Sheet and Plate Storage Racks to Steel Sheet, Tube and Coil Storage our extensive knowledge of the industry assures you that no matter how challenging the problem – Stakapal will provide a solution.